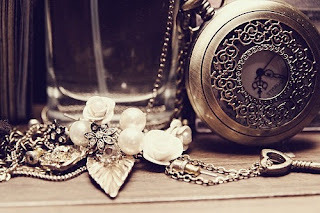 Retro, vintage, classic, antique... These four words have something in common. Guess what? Well, they are some fancy words describing something that is just plain old. But oh is it? When it comes to fascinating jewellery pieces, it is not something even near plain. Vintage jewellery designs of natural elements featured as jewellery pieces were highly in fashion for a long time. They were seen to be more dominant in the Georgian and Victorian period. There was a great popularity of animal and insect themed costume jewellery pieces. The usage of insect and bug motifs in jewellery grew more in fashion popularity in the middle of the late 1800s. Many bug brooches, pendants, and rings were produced because of the high demand of affordable quality along with delicate workmanship. 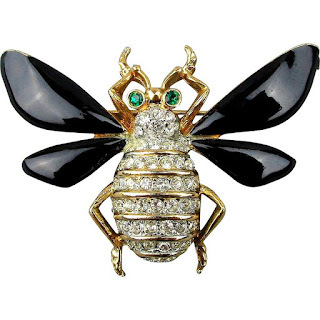 Intricate jewellery pieces made with enamel, Perspex, or rock crystal would be adorned with gems and seed pearls in sparkly and decorative colour combinations to depict the natural beauty of the insect in a unique vintage jewellery piece. What arouses curiosity even today among jewellery lovers is the fact that something that repulses you in reality and you find it more creepy than beautiful than how one could adorn a jewellery piece made to match it. But in an intriguing twist of style, elite class ladies and even men alike would adorn these glittery pieces made to look like insects. "More remarkable was the vogue for insects. Mr William d'Arfey in Curious Relations mentions that in the late sixties 'Bonnets and veils were covered with every kind of beetle; that at least was the beginning of the mode, but it soon extended itself from rose-beetles with their bronze and green carapaces to stag beetles...Parasols were liberally sprinkled with ticks, with grasshoppers, with woodlice. Veils were sown with earwigs, with cockchafers, with hornets. Tulle scarves and veiling’s sometimes had on them artificial bed bugs...' These insects appeared on necklaces, bracelets and earrings, as well as on veils and parasols. Flies of gold, colored with enamel, were set under crystal to form jewels. Butterflies, dragonflies and beetles in gems were worn as brooches and shoulder knots. Bees too, were fashionable, some people thought because they were the emblem of young Prince Victor Bonaparte, who was a great favorite in Paris society"
We just listed this gorgeous antique pendant set with peridot and pearls and made in 9ct gold. The Victorian pendant just shouts quality. The pendant is delicate and intricate and has the typical whiplash style design. 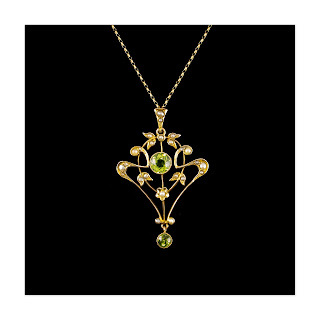 The colour of the green peridot stones against the creamy pearls and gold pendant is so nice.The pearls are various size and set into delicate flowes, leaves and the whiplash style frame itself. The bale is also studded with pearls which just adds to the overall quality of the early piece. We are still obsessed with these fabulous antique lavaliere pendants. Not just because they are so delicate and expertly made by hand but because they are just so attractive. We just acquired this diamond shape pendant with aquamarine stones. 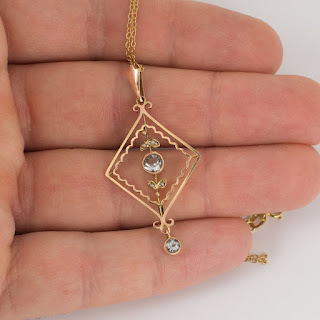 The diamond shape pendant frame also features a wave-like gold inner frame. Inside is set with a round pale blue aquamarine gemstone with small gold leaves set with seed pearls. The lower part displays a further aquamarine drop. The bale is smooth and shapes like a tulip which is a nice touch. I have included a 9ct gold trace chain with the pendant.